Wondering if it is possible for you to gain admission into your most preferred institution with ease,despite the competition? University admission is one of the most discussed topic among high school leavers. You have read and heard from different persons that gaining admission into the university at the first trial is almost impossible. Well, I didn’t get it at the first attempt. However, it could be due to the fact that someone didn’t give me the Ultimate guide to University Admission. In this article, I will share everything you need to know about the university admission process and how you can be admitted this year. Take a glass of chilled water and lets embark on the journey to University Admission. How is the University Admission cut off mark gotten?. How come I scored above the cut off mark, yet I wasn’t admitted? I wrote very well but it didn’t reflect in my result, how come?. How can I score very high in JAMB. It is very difficult to gain admission without bribing. Jamb is not sincere, they cheat people. The University admission is all about luck, not hard work. This is the mark below which one cannot gain admission to study any course. It is 50% for the University of Benin and many other Federal schools. This cut off mark is released by departments every year and it is based on the performance of students. It determines if you will be admitted to study your desired course. Some candidates who score less than the general cut off but above the departmental cut off marks are usually admitted to study courses related to their desired course. The departmental cut off varies for MERIT, Catchment and Educationally less developed States, with that of merit always higher. School catchment area is the geographical area from which students are eligible to attend a local school. You now understand how the University admission cut off mark is gotten and why some candidates are not offered admission even when they score above the general cut off mark. Now lets answer the remaining frequently asked question. Learn basic concepts in computer. Don’t wait for the exams to be close before you start preparations. Early preparation gives you an edge; don’t think that there is still time. Live your life with sense of urgency. Have the mentality, ” I am behind schedule”. Begin to set targets because it will give you a powerful drive towards the exam. Do you want to score 350+ in Jamb? It all begins from now. Remember, a man who fails to plan is indirectly planning to fail. Joshua Abuwa said, “The problem with a lot of young persons today is that they don’t have visions, they only have television”. In your quest for university admission, what can you see?. Your worth in life is tied to the quality use of your mind. Empty the coins in your purse into your mind and your mind will fill your purse with gold. Reading quality books for your examination will give you nothing, but quality grades. For every examination, there is a course outline. This guides you on the topics and parts of the topicS to cover. It is essential you get the books that cover the required topics and sub-topics. The Joint Admission and Matriculation Board (JAMB) usually recommends texts. Get them and start studying as soon as possible. You may want to buy Dandy English or New Testament of the use of English by Joseph Omofomah for your Use of English. Your habits determine your habitat. It is high time you develop a solid study habit. Need help? here is how to start. Before you study, make sure that you are relaxed physically, emotionally and mentally. The following study practices might be of good help to you. Study in an environment that is best conducive for you. It doesn’t really need to be calm; if a noisy area is OK for you, go with it. Read with revelation. Draw a plan of what you should achieve after the study. All materials that guarantee smooth learning must be ready to avoid searching in the midst of learning. Get a Jotter to put down salient facts. Don’t skip any part of the material if you don’t understand it. Prepare a study time-table and follow it consecutively. Prepare a rest and recreation time-table too. Funny? Read the 10 secrets of successful students. And how to remember 90% of what you have read. Know the nature of questions to expect. Take note of the frequently asked questions. Examine your level of preparation by putting yourself in the exam condition. Note: Most past questions pack have answers at the back. Do not check the answers before you solve the problems. Just make sure that you understand the questions. Like I always say, “telling yourself the truth is honesty but telling others is integrity. Find out what works for you and what doesn’t. Find that the subjects and topics you find very easy to learn. In addition, don’t run away from the ones giving you tough time. Do everything possible to give them tough time too. Just imagine loosing 80 marks in mathematics just because you fail to fall in love with it. Handle your weakness or your weakness will handle you. Who you associate with determines whether you will dissociate or appreciate. There are people who add to your life, those that subtract from you, those that divide and those that multiply you. Identify those who add to and multiply your success. There is no where you want to go that people haven’t gone to. Look for people whose realities are your dreams. Any question you get wrong, there are people who will get it right. Some answers follow a pattern. This pattern can help you get the questions you don’t know the correct answers to. After every 30 minutes go back to the questions you think you have answered to be sure if you actually answered it correctly. Sometimes the brain deceives. Increase your speed and don’t leave any option blank. No matter the motivational books you have read on exam success, the efficacy of hard work cannot be over emphasized. Don’t study for exams the way you study newspapers. Put in effort in your study. Study, but study wise. 9. BE UP TO DATE on your exam date and procedures. Don’t fail to read articles relating to exam success as well. 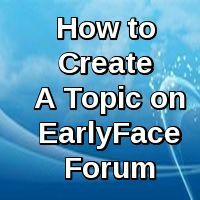 Visit www.earlyface.com.n g for news relating to your school. Learn BASIC CONCEPTS in computer since most of your exams will be computer based. Make sure you click the answers and also confirm the click.